Megali Ammos holidays have broad appeal. Located one kilometre south of Skiathos, the capital of Mykonos, the resort benefits from a wealth of amenities and tourist attractions. Since the resort is spread around a long bay with a kilometre of shingle beach, holidays in Megali Ammos are very popular with families. The clearest of water offers safe bathing for children and less confident swimmers and water sports are available from the beach. Holidays to Megali Ammos can be taken from April until October when temperatures rise from twenty to low thirties in the height of the season. Our cheap Megali Ammos holidays are considered great value for money as our commitment to quality and service is never compromised. With hotels and apartments providing good accommodation, restaurants and tavernas serving a diverse menu and shops for essentials, our low cost Megali Ammos holidays are sure to please. 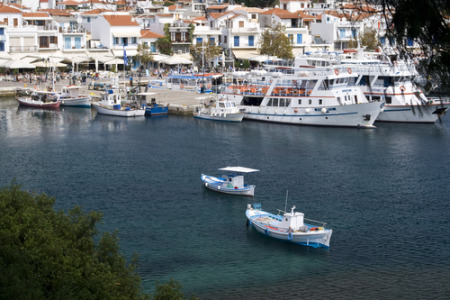 Nightlife here is low key but if livelier times are needed, Skiathos is on the doorstep. For more information and to view our Megali Ammos holiday offers, please use the search facility.